On the weekend The Australian published a lengthy article by Chip Le Grand on antifa in Australia. The first rule of antifa is you do not talk about antifa. Not to a journalist, at any rate. It is less an organisation than a broad objective across the radical left; a determination to block, frustrate and ultimately silence far-right politics. It is fundamentally illiberal and necessarily secretive. For these reasons, it is poorly understood and readily mischaracterised. To the best of my knowledge, there have only been one or two occasions on which anTEEfa in Australia have spoken to journalists. First, ‘Beneath the black mask: inside Australia’s anti-fascist Antifa groups’ (Peter Munro, The Sydney Morning Herald, May 21, 2016) contains interviews with three anti-fascists. Secondly, a former anti-fascist, Shayne Hunter, was recently interviewed for a piece in the Murdoch press (‘I established a terror movement in Australia, and I quit’, news.com.au, October 25, 2017). Perhaps the first time the term was used in media reportage in a local context was 2014 (Australia’s Golden Dawn Rally Falls Embarrassingly Flat, Lauren Gillin, VICE, May 7, 2014). See also : Cronulla protests: what is the anti-fascist group Antifa?, Michael McGowan, The Sydney Morning Herald, December 12, 2015 | Explainer: what is antifa, and where did it come from?, Troy Whitford, The Conversation, August 30, 2017. Beyond that: while it’s true that ant-fascists generally seek to disrupt fascist organising, completely eradicating far-right and fascist politics is hardly an achievable objective. Instead, most seek to simply limit, as much as possible and given the means available, the growth of such political expressions. The liberality of these actions, as well as their public status, is generally determined by their context. Antifa activists are not mindless thugs. They are well organised and, generally, experienced political and social activists who are prepared to resort to violence — they say reluctantly — to deny the far right any platform from which to promote its ideas. In Melbourne and Sydney this week, they mobilised more than 100 supporters within an hour to shout down a speaking event by the alt-right’s charismatic bomb thrower, Milo Yiannopoulos. Leaving aside the alleged mindlessness and thuggery (and the claim that Milo is ‘charismatic’), the fact that several hundred people (ie, several hundred more than 100) mobilised in Melbourne in order to protest Milo Yiannopoulos’s performance at Melbourne Pavilion last Monday was. not. simply. the result of a preparedness to act at short notice, but rather active campaigning over months (and years). [snip] The antifa view of the world is that far-right politics — particularly white supremacy, nationalist chauvinism and the kind of fascism that tore Europe apart in the middle of the 20th century — is again on the rise across Western democracies. Accurate or otherwise, that’s not a view confined to those actively opposing white supremacy and ultra-nationalism, as a search for relevant materials would demonstrate. To put it another way: there’s a rational basis for concern over a resurgent far-right in Europe, both Western and Eastern. That said, Australia is somewhat peculiar in terms of Western democracies, a theme also explored in the relevant literature. Or as Oswald Mosley claimed in 1933: ‘I always thought it remarkable that Australia, without studying the Fascist political philosophy and methods, so spontaneously developed a form of fascism peculiarly suited to the needs of the British Empire.’ See also : Australian Critical Race and Whiteness Studies Association (ACRAWSA). In the US, this conviction has made bedfellows of anarchists, Marxists, socialists, anti-racists and other militant activists beneath the antifa doona. In Australia, existing left-wing groups such as Socialist Alternative have diverted resources from other campaigns to fight what they describe as the fascist menace. New groups, such as Jews Against Fascism, have formed to fight the far right. In the US, contemporary antifa activity is generally traced back to the 1980s, when youth subcultures like skinhead and punk were the subject of concerted efforts at infiltration by the radical right, which in turn generated (militant) opposition. Hence it was in the late ’80s that Skin Heads Against Racial Prejudice (SHARP) formed in New York and Anti-Racist Action (ARA) was born, the groundwork for the latter being laid by a skinhead crew in Minneapolis called The Baldies. (ARA’s contemporary expression is the Torch network.) A lot has happened between Then and Now, but certainly the Trump era has given added impetus to antifa organising in the US. See also : Inside the Underground Anti-Racist Movement That Brings the Fight to White Supremacists, Wes Enzinna, Mother Jones, May/June 2017. Otherwise: SAlt was largely absent on April 4, 2015, this also being the weekend of their annual Marxism conference, and the opposition to Reclaim on that occasion was drawn from other segments of Teh Left in Melbourne. The antifa armoury includes more than protest chants and punches. Mark Bray, formerly an activist in the Occupy Wall Street movement, is the author of Antifa: The Anti-Fascist Handbook, published in Australia by Melbourne University Press. In interviews with anti-fascist activists in Europe and the US, Bray explores antifa tactics including the dark art of doxxing, a form of online sabotage pioneered by computer hackers. In the antifa context, doxxing means the outing of Nazi sympathisers — the publication of ­information that identifies anonymous far-right bloggers or activists, which in turn puts pressure on employers to sack them. This year a University of Nebraska philosophy student, Cooper Ward, was doxxed and unmasked as the voice on an anti-Semitic podcast, The Daily Shoah. Bray says he was driven off campus and into hiding. “Despite the media portrayal of a deranged, bloodthirsty antifa … the vast majority of anti-fascist tactics involve no physical violence whatsoever,” Bray writes. First, yes, ‘d0xxing’ is A Thing … though in Australia it tends not to extend as far as it does elsewhere. Thus, in my own case, while I’ve named a number of local AltRight figures — David Hilton (‘Moses Apostaticus’) is one recent example — I don’t publish full deets, most infos is drawn from open-sources and often relies upon simply drawing upon previous research (or is the result of a tip-off). Thus it’s also been possible to identify a number of the nazis who assembled outside Melbourne Pavilion last week simply by referring to previously published material. Inre Cooper Ward and ‘The Daily Shoah’, Ward was one of several neo-Nazis ‘outed’ at this time, including Mike Peinovich (‘Mike Enoch’). His outing as a neo-Nazi activist resulted, inter alia, in his separation from his (Jewish) wife — but the Shoah must and has gone on. Unmentioned but relevant in this context is that both the sitting MP George Christensen and former Labor leader turned angry old pensioner Mark Latham have appeared as guests on the podcast network TRS (for which ‘The Convict Report’ is the local expression). 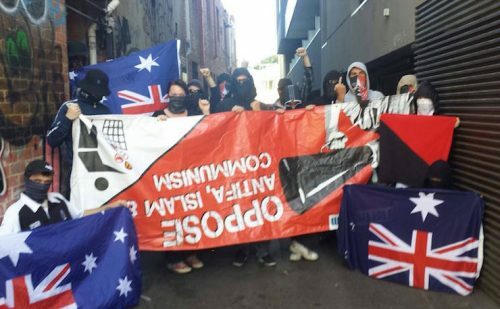 [snip] A problem for the Australian antifa, and indeed for anti-fascist groups in Europe and the US, is that few people and organisations they oppose here have much to do with Nazism. Consider the rollcall of hard-right leaders who turned out in Kensington in support of Yian­nopoulos. Neil Erikson, a far-right agitator and leader of a small group known as Patriot Blue, used to be a Nazi but in recent years has publicly disavowed his former beliefs and now says he is a supporter of Israel. Who you calling a Nazi, Nazi? First, Erikson has publicly acknowledged the fact that, from his early- to mid- teens through until the end of 2015/beginning of 2016, he considered himself — and was considered by others — a neo-Nazi activist. A former member and/or associate of Blood & Honour and Nationalist Alternative, Erikson, in addition to having a criminal conviction for stalking a rabbi (February 2014), also ran with the short-lived gang ‘Crazy White Boys’, responsible for the attempted murder of Vietnamese student Minh Duong in 2012. Secondly, prior to ‘Patriot Blue’, Erikson had cycled through numerous other brands and Facebook platforms, and no doubt will jump on another bandwagon when it suits him. Finally, given his record, it’s not unreasonable to view Erikson’s posturings — first as a neo-Nazi, now as a ‘supporter of Israel’ — with some degree of skepticism, and to view his performances as being simply (and more accurately) opportunistic exercises by an attention-seeking, racist, meathead. 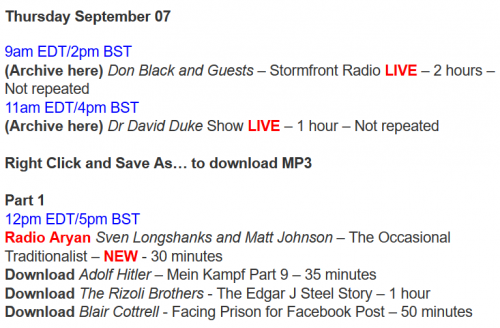 Blair Cottrell, the hulking former leader of the defunct United Patriots Front, is fascinated by Adolf Hitler as a historical figure but ridicules neo-Nazism as a contemporary political movement. Or; Pull the other one (it’s got bells on). Avi Yemini, a tough-on-crime activist, is a former Israeli soldier. He recently joined Cory Bernardi’s Australian Conservatives and hopes to stand as a candidate in next year’s Victorian election. Yemini is not a neo-Nazi, though he wouldn’t be the first Jew to assume such a mantle (cf. Danny Burros and Nathaniel Jacob Sassoon Sykes). Indeed, in May 2013, one Jewish bloke and Republican Party booster, David Cole/Stein, was exposed as a Holocaust denialist; most recently, he’s gone into bat for local ‘transcendental’ fascist Richard Wolstencroft. In any case, Yemini certainly loves associating with neo-Nazis and other fascists, and rarely misses an opportunity to join with them in castigating Bad People (leftists, Muslims, et. al.) for their crimes. On his relationship to the wider Jewish community, this statement by the Australian Jewish Democratic Society is germane. As for Yiannopoulos, although some of his supporters are Nazi sympathisers — Inquirer was sent a picture of a man giving a Nazi salute as he walked out of his Kensington speaking engagement — there is scant evidence that he is. When Yiannopoulos was preparing a treatise on the alt-right for the Breitbart website early last year, he sought the input of a white nationalist blogger and self-described Nazi, Andrew Auernheimer, and forwarded it along with contributions from other hard-right figures to his co-author, a Breitbart staff journalist. When the Buzzfeed news site obtained emails exchanged between Auernheimer and Yiannopoulos, it reported them as proof that “Breitbart and Milo smuggled Nazi and white nationalist ideas into the mainstream.” There was no smuggling involved, Nazi or otherwise; Yiannopoulos’s treatise was a rambling cook’s tour of right-wing groups, with Auernheimer quoted as an on-the-record source. Actually, the Buzzfeed article — Here’s How Breitbart And Milo Smuggled Nazi and White Nationalist Ideas Into The Mainstream (Joseph Bernstein, October 6, 2017) — does a little more than document the fact that Yiannopoulos sought the input of neo-Nazi weev into one article he — or rather one of his Breitbart lackeys — wrote. Inter alia, the article ‘also reported that Yiannopoulos’s passwords included references to Kristallnacht, the 1938 anti-Semitic German pogrom that historians mark as the beginning of the Holocaust, and the Night of the Long Knives, the murderous 1934 purge of Hitler’s onetime allies by Nazi paramilitaries.’ It also contains footage of Milo singing karaoke while his friends make Nazi salutes. In any case, Roger Mercer, the billionaire hedge-fund manager bankrolling Breitbart and Milo, recently withdrew his support (citing ‘personal reasons’ for doing so). On June 15, 1917, President Wilson signed the Espionage Act, which delineated punishments for foreign spies and prohibited organized resistance to WWI. A great deal of repressive federal and state legislation followed, including the Trading with the Enemy and Sedition Acts. The government apparatus for enforcing these laws also expanded, including to the recently formed Bureau of Investigation (a precursor to the FBI). These mechanisms were used against anarchists, the IWW, and other left-wing organizations: on the same day that the Espionage Act took effect, police arrested Emma Goldman and Alexander Berkman. The leader of the Socialist Party, Eugene Debs, was sentenced to ten years in prison for delivering an antiwar speech in Ohio in June, 1918. The ‘Red Scare’ of 1917–1921 reached a peak with the Palmer Raids of November 1919 and the targeting of the Union of Russian Workers, an anarcho-syndicalist labour union composed of Russian immigrants. On November 8, 700 police raided seventy-three radical centres, arrested more than 500 individuals, and seized tons of literature. Many of those arrested were transported to Ellis Island and deported to Russia on the transport ship, the Buford. Over 3,000 people were deported in 1919, 2,000 in 1920 and over 4,500 in 1921. … starting with the entrapment case of Eric McDavid—framed for a single conspiracy charge by an infiltrator who used his attraction to her to manipulate him into discussing illegal actions—the FBI seem to have switched strategies, focusing on younger targets who haven’t actually carried out any actions. They stepped up this new strategy during the 2008 Republican National Convention, at which FBI informants Brandon Darby and Andrew Darst set up David McKay, Bradley Crowder, and Matthew DePalma on charges of possessing Molotov cocktails in two separate incidents. It’s important to note that the only Molotov cocktails that figured in the RNC protests at any point were the ones used to entrap these young men: the FBI were not responding to a threat, but inventing one. The FBI’s politically repressive activities did not commence during the 1960s, nor did they end with the formal termination of COINTELPRO in 1971. On the contrary, such operations have been sustained for nearly a century, becoming ever more refined, comprehensive and efficient. This in itself implies a marked degradation of whatever genuinely democratic possibilities once imbued “the American experiment,” an effect amplified significantly by the fact that the Bureau has consistently selected as targets those groups which, whatever their imperfections, have been most clearly committed to the realization of egalitarian ideals. All things considered, to describe the resulting sociopolitical dynamic as “undemocratic” would be to fundamentally understate the case. The FBI is and has always been a frankly anti-democratic institution, as are the social, political and economic elements it was created and maintained to protect. Naturally, anti-fascists organise not only to defeat fascism, but also to combat repression. The International Anti-Fascist Defence Fund is one such project, but there are others, and no doubt there’ll be more as the state — increasingly, in close collaboration with the corporate sector — acts to repress dissent. See also : What Chip Le Grand gets wrogn about the Australian ‘alt-right’ (September 10, 2017) /// Three Way Fight /// Anti-Fascism Beyond the Headlines: Mattilda Bernstein Sycamore Interviews Mark Bray, LA Review of Books, December 11, 2017. The risk here is that, in the absence of genuine Nazis to punch, antifa will employ its tactics against people who hold legitimate conservative political views. Bray, who introduces his book as a “unashamedly partisan call to arms”, defends militant anti-fascism as a “reasonable, historically informed response to the fascist threat”. If that threat in Australia is more perceived [than] real, where does that leave antifa? This entry was posted in Anti-fascism, History, Media, State / Politics and tagged ACRAWSA, Alt Right Australia, alt.right, Alternative Right, altright, Andrew Auernheimer, Anti-Racist Action, Anti-Semitism, antifa, Antifa: The Anti-Fascist Handbook, Antipodean Resistance, Aryan Nations, Australian Conservatives, Australian Jewish Democratic Society, Avi Yemini, Blair Cottrell, Blood & Honour, Bradley Trappitt, Breitbart, Buzzfeed, Campaign Against Racism and Fascism, Chip Le Grand, Christopher Wray, Combat 18, Combat 18 Australia, Cooper Ward, Cory Bernardi, Crazy White Boys, Danny Burros, David Cole, David Hilton, David Stein, FBI, George Christensen, Gianfranco Crestiani, Here's How Breitbart And Milo Smuggled Nazi and White Nationalist Ideas Into The Mainstream, Holocaust, Jean-Paul Sartre, Jews against fascism, Jewsagainstfascism, Jim Perren, Jordana Silverstein, Mark Bray, Mark Latham, Mein Kampf, Melbourne Pavilion, Mike Enoch, Mike Peinovich, Milo Yiannopoulos, Moses Apostaticus, Nathan Sykes, Nathaniel J.S. Sykes, Nathaniel Jacob Sassoon Sykes, Nathaniel Sykes, Nationalist Alternative, Neil Erikson, Omar Hassan, Oswald Mosley, Patriot Blue, Pauline Hanson, Radio Aryan, Reclaim Australia, Richard Wolstencroft, Shayne Hunter, Shermon Burgess, Skin Heads Against Racial Prejudice, Socialist Alternative, The Australian, The Convict Report, The Daily Shoah, The Dingoes, The Lads Society, The Protocols of the Elders of Zion, The Protocols of the Meetings of the Learned Elders of Zion, TheDingoes.xyz, therightstuff.biz, Torch anti-fascist network, Torch Network, Troy Whitford, United Patriots Front, weev. Bookmark the permalink. Quite apart from the fact that punching a nazi would do nothing to roll back nazism, it’s interesting to note Aamer Rahman dropping the eradication word. Once you start talking about eradication then you’re starting to enter the spectrum of nazism yourself, particularly when you consider that feelings of xenophobia and love of one’s ‘kind’ could well have a congenital basis, in which case, there are a hell of a lot of people to be eradicated. Nazi-like, anti-social phenomena are things that possibly can only be managed, not eliminated, and managed best through means much more subtle and varied than the application of dumb violence and public displays of petulance.